I was terrible at Maths. I had never learned the basics – times tables, long multiplication – nothing. When I sat the entrance exam for an assisted place scheme to go to a local private school, I scored almost nothing on the Maths paper. The kind Headteacher led me through the paper question by question, one to one, and decided to offer me a place because I seemed to understand it, I had just ‘never been taught it.’ Once ensconced in the private school that changed my life, I was sent to top set Maths. I struggled. I made my teacher, Mrs Meadows-Smith’s, life a misery. I asked stupid, time-wasting questions. I hated Maths. And so the next year, I was placed in the third set for Maths. And I loved it. Finally, I could understand what was going on. Mr. Shepperson’s explanations were clear, and his enthusiasm was encouraging. I spent a term in set 3, before being propelled again to set 1. Where again, I hated it. We took a half-termly test, and every half term I came bottom, or second from bottom. On the eve of year 11, I heard someone say in an off-hand way: ‘The kids at the bottom of set 1 will get Bs; the kids at the top of set 2 will get As.’ That was it. I petitioned the Head of Maths, and got to join set 2… Again, with Mrs. Meadows-Smith. That poor woman. I had learned nothing in terms of behaviour, and continued to be distracted and annoying. She persevered. She never once raised her voice. She was kind and patient, even though I was her literal nightmare. I have no idea how I managed to get an A at GCSE Maths, but I imagine it was 5% due to me, and 95% due to Mrs. Meadows-Smith. By the end of year 11, I loved Maths, because I could do Maths, and Maths is incredible when you can do it. I asked the Head of Maths if I could do Maths A-level. The response was categorical: no. I may have ‘scraped an A’ at GCSE (code for: we have no idea how this has happened but we are very happy for you), but I could only hope for a C at best in the AS level, not to mention the even harder A-level. He was right. But when I walk the corridors of any school, I always linger a little longer in Maths classes. Maths is different to basically every other lesson in schools. The operations required are different. The method, in many ways, is different. Children do not encounter Maths in any other lesson apart from Maths: Maths teachers have the hardest job in terms of getting children to understand their subject. Reading Craig Barton’s How I Wish I’d Taught Maths has only convinced me more that I wish I could teach Maths. But the book is about so much more than Maths. 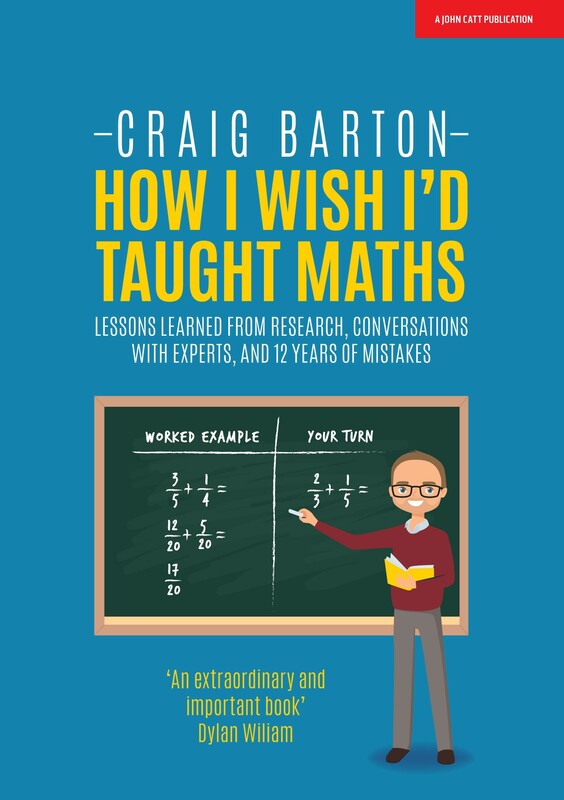 Barton’s journey is one many readers will recognise: ‘mid-career’ he hit a ‘crisis’, whereby he realised that much of what he had done was actually ‘wrong,’ and did not lead to greater student understanding of Maths. He embarked on a mission to find out how to do it better, and this book is a record of that mission. Each chapter follows the same helpful pattern: what Barton used to think, what he has read on that particular subject (always an astonishing amount of books, journal articles and a few blogs thrown into the mix), before a useable summary of his ‘takeaways’, which, because they are written by an actual teacher who teaches actual children, are completely actionable and never require bonkers amounts of effort. So much of this book is helpful beyond Maths – chapters on how children learn, the novice/expert issue, what motivates learners, how to get better at instruction, cognitive load theory, worked examples, deliberate practice, formative assessment and long-term memory all include a useful précis of the science involved plus applicable insights for teachers of all subjects. For example, in a chapter exploring what motivates students, Barton talks about the balance between struggle and success, something that every teacher will recognise: while we do want children to ‘struggle’ a bit, so they find the work challenging, and endure the kinds of difficulties that ensure their thinking is engaged, we also need them to succeed so that, long term, they will be more likely to persevere. Yet we don’t want them succeeding too easily, or all the time. Barton’s exploration of tricky issues like this, with his perspective as a working teacher, is invaluable. One example of a transferable, useful and research-informed trick Barton shares is to get students to give each answer they write a ‘confidence score’ out of ten prior to marking. The idea is that it makes the children think about how much they think they know something. When they then go through and self-correct, they are more likely to take in the mistakes they have made and remember to not do it that way again. This is the ‘hypercorrection’ effect, whereby ‘errors committed with high confidence are more likely to be corrected than low-confidence errors.’ Another of my favourite insights is that student learning is significantly improved following self-assessment, but students who have peer marked do not experience as much improvement. This is a great nugget of research that will save countless minutes of class time across the land (‘I don’t have a partner’/‘no, that’s a 2 not a 3!’/‘Miss, he’s doing it wrong/making a mess of my book!’). Having endured many ‘co-planning’ sessions, I, like Barton, was perplexed: why does all the research suggest co-planning leads to better teaching, but every session I sat through seemed like a total waste of time? Barton’s insight is that planning a lesson together is less helpful than writing questions together. To transfer this out of the Maths domain a little, we might think of this as creating the lesson content together, rather than the logistics of a lesson together. Indeed, I increasingly think the best way to support teachers is to give them (or co-create with them) the lesson content, and then use coaching to ensure they are delivering that content in the best possible way. Obviously, all of the examples in this book are of Maths, and I’m afraid I am unqualified to share my insights on how helpful these are; though I defer to two readers, Kris Boulton and Dani Quinn, whose Maths skills are, in my view, unparalleled: their effusive praise for the book speaks volumes (Maths pun attempted). One of my favourite things about reading excellent books are their citations. After reading Barton’s book, my Amazon wishlist is absolutely bursting with education tomes, which works well with my new year’s reading resolution to read more non-fiction books. So what will I do now? The plan to get a Maths A-level looks to have legs, thanks to Kris Boulton’s ‘Up Learn’ project, and, life-logistics depending, I’m hoping the next five years will see me re-engage with Maths in a more formal way. In the mean time, I will continue to lurk in Maths classrooms, and lend Barton’s book to everyone I know who actually does teach Maths (and to a few people who don’t).